Positive Parenting Tips: The Power of P.M.S. Immediately, you're thinking of PMS -- Pre Menstrual Syndrome. I know you are. Well, can I be honest? I got rid of that years ago. I can thank my husband. During our first month of marriage (the honeymoon stage), he came home one day to a very ornery wife. "What's the matter?" he asked. "Why are you so upset?" "OH! I don't know!! I'm on my period!" Can you imagine saying that to your newlywed, menstruating wife? Well he did. But when he asked, "So? Why does that make you ornery?" -- well, I didn't really have a good answer. Why did it make me ornery? I started to think about it, and he started telling me that I had control over my emotions. Coming from the shy, timid, teenager with a red-headed temper who was now outgoing, enthusiastic and never got angry -- well, I figured there was something to what he was saying. As a new, adoring wife, I believed my husband, and decided that being 'PMSy' wasn't something I needed to do anymore. And so I didn't. That was 13 years ago. Does that mean I'm always happy and never get ornery, or feel (physically) perfect during 'that time'? 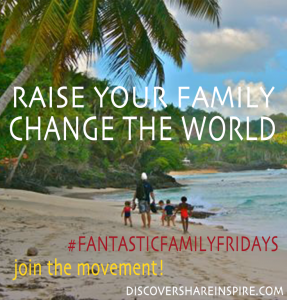 What does this have to do with creating a fantastic family? The choices we make and the behavior we model will be foundational in molding our kids -- how we feel, how we react, how we live. Maintaining self-control is HUGE in creating a fantastic family culture. 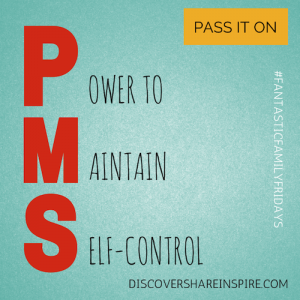 Do you think that PMS is an excuse we use around our house for why we're acting the way we are? Not on your life. Does that mean there is never any drama? Of course not. But we recognize it for what it is… a lack of emotional control, instead of placing blame on some outer circumstance or situation. If we allow something like PMS to be the 'cause' of our distress, then ultimately we're giving up control, we're giving up power and admitting that 'life' and what happens to us determines how we feel. What does this actually teach our children? We need to learn this, and teach it to our children (because we can't pass on what we do not have) -- we need to help them learn to recognize emotions, and to guide them in the right direction if they're getting 'out of hand'. But giving ourselves or our children an excuse for poor behavior and poor emotions (it's that time of the month, it's his red hair, it's just how she is) is not empowering, but enslaving. It limits our life potential. Greg and I had our first P.M.S. before we had any children. We met together on that 'ornery' occasion and made some decisions that impacted the rest of our life, such as the attitudes we would develop that will ultimately impact our children. The P.M.S. 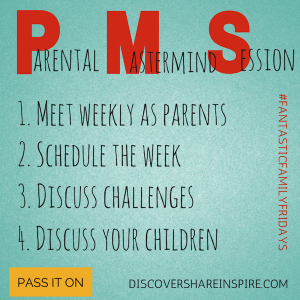 (Parental Mastermind Session) is a habit that we continue today. It's a crucial element to creating a fantastic family. [pullquote quote="dark"]With your spouse, meet weekly to discuss your children to build a strong family culture. (Click to tweet)[/pullquote]It's like the foundation to a house, or more accurately, the blueprint. It's the business meeting where the business plan is created. It's the cornerstone of a smooth, well-oiled, happy family machine. For Greg and I this happens on a Sunday, because it's a day we choose to rest and relax and plan for the upcoming week, but you could do it any day that works. 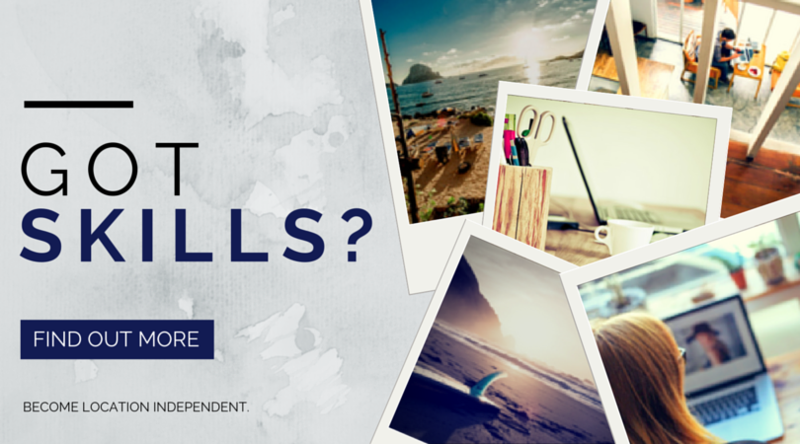 Any appointments, meetings, lessons, and any other events. This would also include the discussion of things such as "Joey really needs some one-on-one time," or "We need to take a trip to the beach." Preferably, you also want to 'schedule' some free time on the calendar. Families thrive when they have space to just 'be'… this constant go, go, go can be detrimental to the family culture. Individually, the wife and husband can present their concerns, and they can be discussed until solutions are found, or they decide to post pone until the next P.M.S. This isn't a complaining session, but an opportunity to discuss issues and to come up with family policies or make decisions. If a problem comes up during the week, (or even if an argument arises) you can choose to postpone discussing it until the weekly P.M.S. You know it will have a time and place to be addressed, in a calm and clear manner, but oftentimes the problem is diffused or solves itself by the next meeting. This is an important opportunity to discuss together each of your children individually -- their challenges, struggles, strengths, concerns, talents, doubts, etc. Just doing this together can give you so much insight into your family and the unique needs of each of your children. There is POWER in this practice! It's the first and most important step to mentoring your children toward greatness. This simple practice of the weekly P.M.S. is the first step toward creating a Fantastic Family. We encourage you to begin implementing it this week. Oh, WOW! this is so good! We have done this weekly meeting before at our house, UNPLANNED, and on those weeks everything is much more peaceful and smooth. Definitely got to implement this to be a PLANNED on PURPOSE meeting every week. Thank you so much for this insight. Excellent tips, thanks for sharing them. I really love this idea of a spouse meeting weekly. My husband works such long hours we both feel he’s missing out on a lot of things going on with the kids. We also both struggle with communicating what’s REALLY going on and not just the cosmetic day to day stuff. 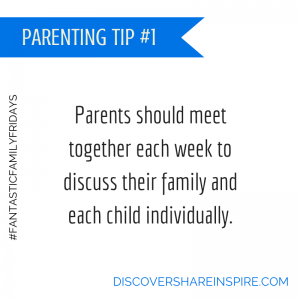 I think implementing this weekly meeting idea is going to be a great tool to really elevate our relationship as a couple and a family. A fantastic way to re-connect and ‘catch up’… thanks for your thoughtful comments.